Choose a surface mounted or recessed medicine cabinet with a mirror or paneled door, with or without drawers or open shelf. If you are looking for our smaller recessed or surface mounted medicine cabinets click here. 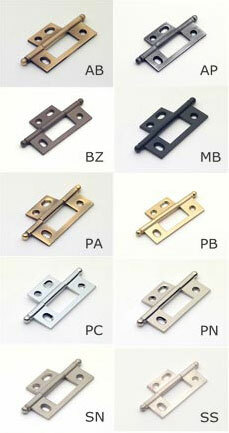 For concealed medicine cabinets click here. Looking for a more formal style? 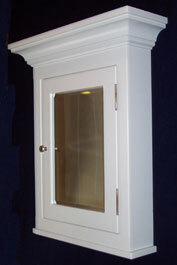 We now have medicine cabinets with a beautiful crown molding top. Our painted cabinets are built from Poplar in your choice of 56 Milk paint colors. 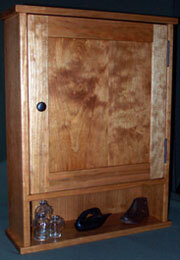 Our white oak medicine cabinets, seen here, come in 9 beautiful stains. Options: Order yours with a solid wood paneled door or with a mirror. 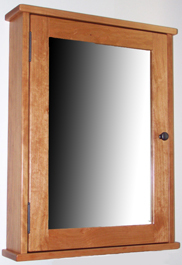 Our mirrors are very high quality; a full ¼" thick with your choice of ½" beveled glass or no bevel. 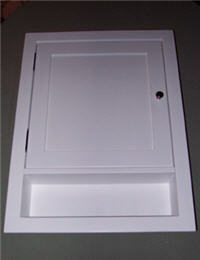 Our Crown Molding Style recessed medicine cabinets come in your choice of 3-3/4", 4", 5-3/4", or 6" deep. The outside dimensions of our recessed cabinets are 21" wide x 28" high. Including the crown they are 26-1/2" wide x 31-1/2" high. A rough opening slightly larger than 19" wide x 26" high is needed. 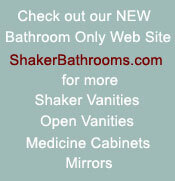 If you are looking for our smaller recessed medicine cabinets click here. Above: Our Crown Molding Style surface mounted medicine cabinets are 21" wide x 28" high and are either 4 1/2", 5 1/2" or 6 1/2" deep. Including the crown they are 26-1/2" wide x 31-1/2" high. 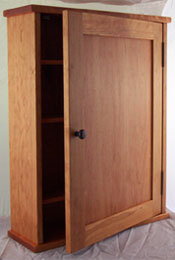 Our surface mounted and recessed medicine cabinets come with three adjustable shelves. If you are looking for our smaller surface mounted medicine cabinets click here. Above: Our Shaker Style surface mounted medicine cabinets are 20" wide x 26" high and are either 4 1/2", 5 1/2" or 6 1/2" deep. Our standard surface mounted and recessed medicine cabinets both come with three adjustable shelves. 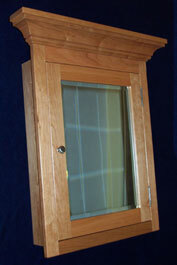 Our Shaker Style recessed medicine cabinets come in your choice of 3-3/4", 4", 5-3/4", or 6" deep. We also have a combo 5-3/4" and 6" deep cabinet [shown above] which only needs a 3-3/4" or 4" deep wall cavity because the other 2" remain on the outside of the wall. The outside dimensions of our recessed cabinets are 21" wide x 28" high. A rough opening slightly larger than 19" wide x 26" high is needed. If you are looking for our smaller recessed medicine cabinets click here. Shaker Style Surface [above] and recessed [below] medicine cabinets can be ordered with an open shelf; with two adjustable shelves inside. 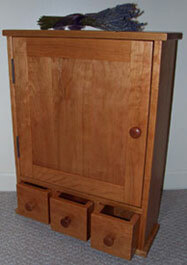 Our Shaker Style surface mounted medicine cabinet can be ordered with three apothecary styled drawers. It comes with two adjustable shelves inside. NOTE: Prices shown below are full price. However, only 50% is due at time of order with the balance due when your item is ready to ship. Shipping is 10% of the finished price. If you chose a painted finish above, choose your paint color below, otherwise scroll down to Step 4 to enter style and depth. Select the Benjamin Moore Option at left and then enter the Benjamin Moore color number and color name in Step 5 below. If needed, visit the MyPerfectColor web site to help you pick out that perfect color you are looking for. Combo Recessed, 5-3/4" deep (price +25% for this style) only needs a 3-3/4"" deep wall cavity! Combo Recessed, 6" deep (price +25% for this style) only needs a 4" deep wall cavity!